The ThINKin' Spot: Still Hoppin' with the Peachy Keen Mini Release and Country Bumpkins! Still Hoppin' with the Peachy Keen Mini Release and Country Bumpkins! Good morning!!! Well, it's Wednesday, we're halfway through the week, and still celebrating and hopping for the new Peachy Keen Stamps mini release/Country Bumpkin Stamps release. Today I have another cute little Max card to share with you. I kept things pretty plain and simple with this card, and I just love doing that once in a while. Would you believe that "simple" is very, very, difficult for me? It always seems like I keep looking for something else to do, or add, but that's not the case with this one. I colored Max with red hair this time, because I really like playing with the different color combos for hair, and it just gives each one you try a whole different look. I've found that nearly anyone can color this little guy up and say that he looks just like their son, or grandson, or nephew. LOL!! There's a lot of truth to that, too. Depending on what colors you use, you can make him look like just about any little adorable fella you know. As is usually the case, I colored this Max with Copics, and boy, was it EVER a difficult thing to make his little face dirty with some distress ink!!!! I kept thinking I was going to mess it up and have to start all over. I think I managed to get him plenty dirty without overdoing it this time, and I love the way he turned out. There's still time to get in on the great savings and giveaways for this blog hop. 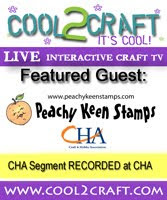 Just follow along with the blogs below for your chance to win one of the $15 gift certificates that each designer is giving away, and also check out the Peachy Keen Stamps Store for ll the wonderful savings that are going! There are great deals EVERY StoreWHERE, and you just shouldn't miss out on anything this good!!!!! Thanks for stopping by today. I wish for you a very blessed and happy day, and of course LOTS of happy stamping!! Great card, love the use of distress ink!! This little cutie just warms my heart and brings such a flood of warm memories of my little guy, dirt and all. Lorie he turned out so adorable... I wouldn't have known "simple" was hard for u because it is just perfect.. Love the little corners.. Beautiful job coloring. Love your card!! This stamp is so cute!! This little guy is just so darn cute I can't stand it! Thanks so much! Lorie, this card is amazing! It's far from simple. I love love love his hair it's just glowing like light is shinning on his red hair. Look at the cute frog in his pocket. How cute is he? Love him and his frog! Wonderful little boy card--I like how you were able to make him dirty. OMgosh this is super CUTE!!! Love the lil' image you used, he is darling!! Beautiful job as always hun!! !